3 Ways To Climb The Breithorn, The Easiest Of All Four Thousanders. The Breithorn is a beautifully curved, 4,164 meter (13,661 ft) high mountain peak with its summit lying on the border of Switzerland and Italy. Zermatt, in the Swiss Canton of Valais, would make the best starting point for your trip. It is considered the easiest of all 4,000 meter peaks in the Alps. This is due to the cable car leading to the Klein Matterhorn (3,883 m). From that point, a mere 300-meter or 3-hour bid divides you from its summit. Still, the terrain is glaciated, making basic alpine knowledge necessary. However, it is not only the facility of climbing this mountain that attracts so many climbers. The Breithorn is located between the Monte Rosa massif and the Matterhorn, giving it an idyllic location with great views of two awesome mountain ranges. As the Breithorn is regarded as the easiest to climb of all the 4,000 meter peaks, this is not the main reason why it is a popular climb for mountaineers. Closely nestled between the Monte Rosa massif and the Matterhorn, the Breithorn has a unique location providing views of the most famous mountains in the Swiss Alps. Live view of the Matterhorn, just next to the Breithorn. Breithorn Climb – relative easy, but best with a guide. With an elevation of 4,164m above sea level and a prominence of 433m, the Breithorn is Italy’s sixth-highest Alps mountain. It is located between Italian and Swiss border; specifically in the Valais and Aosta Valley region. The Breithorn which is German for “broad horn” forms part of the mountain range within the Pennine Alps. Its highest peak is the Western Summit. The Breithorn is mostly glaciated with other subsidiary peaks which lie east of the main summit. They include the Roccia Nera, the Central Breithorn, the Gendarm or the eastern Breithorn Twin and the western Breithorn Twin. Its first ascent was recorded back in 1813. The peak season falls in the months of July and August which are the warmest months. However, any time from May to October can be ideal to summit the Breithorn. The Breithorn is considered to be one of the easiest 4,000m peaks in Switzerland to climb. This is because the Klein Matterhorn cable car (from CHF 95,00) is used from Zermatt to take climbers to about 3,820m for a starting point. Its gorgeous views make it quite popular. You can catch the spectacular views of the Monte Rosa Group with all the 4000m and above summits, the Dent Blanche, the Matterhorn and the Weisshorn. There are three main routes to choose from; the South-South-West Face also known as the Normal Route, the Half Traverse of the Breithorn or east ridge of the central summit and the north face (Triftjigrat). It is the easiest route since it is accessible by cable car. The Klein Matterhorn cable will whisk you over 3800m from Zermatt. This will give easy access to the Breithorn Plateau. Rope up for the glacial travel to get across the plateau. Climb diagonally right of the west and central summit. The fine snow will lead you to the west ridge, a few metres shy of the summit. Since it is mostly a glacier and snow route, the primary challenges are high altitude and crampon technique. Avalanches can be a hazard in poor weather conditions. Lives have even been lost. It is a recommended route for beginners or inexperienced climbers. Adequate fitness and basic crampon techniques are a prerequisite. As long as the cable system is working, the route can be attempted all year round. Mostly summer seasons are ideal. Winter attempts can be made however there is potential avalanche danger. A crevasse rescue kit and a 30m glacier travel rope. It is also made accessible by the Klein Matterhorn lift from Zermatt. It has solid, excellent rock and steady snow. The general feel of high exposure makes it a special route. The ridge’s north side is mostly vertical and has a narrow crest. You will need to climb using hands on the north side and feet on small footholds on the south side. Next you will begin the climb traversing the glaciers below the south side. This can be accessed via the Roccia Nera bivouac (Schwarzfluh or meaning Black Rock) to the bergschrund. Short rope the steeper snow to get to the coll at 4,022m. Proceed upwards to the ridge proper. From here you will encounter short sections of snow and exposed easy rock. Climb over the three towers of the ridge. You will then take an easy walk to the east summit and finally traverse a corniced crest to the higher west summit. Descent is via the normal route. A crevasse rescue kit, a few wires, slings and a 50m glacier travel rope. This terrain is a technical climb and you will need adequate knowledge of when to long pitch, short pitch, short rope or long rope. This is a classic alpine climb route. It is quite a lengthy climb, about 1,400m meaning you will have to be fit and fast. From the Gandegg, head downwards onto the Theodul glacier (Theodulgletscher) the move across. Gradually move up and then take a left to the left side of the spur just before the Triftjiplateau. Traverse across this and you’ll reach a steep couloir that’s from the summit. You can either short rope or short pitch to the western summit before an easy descent via the normal route. A crevasse recue kit, wires, slings, ice screws for the belays and a 60m rope for longer pitches. Snowshoes will come in handy especially when crossing the Theodulgletscher. Zermatt is the base for those who wish to see or climb the Breithorn. Zermatt is to Switzerland what Chamonix is to France. This mountaineering village breaths history as you will see traces of the past. Not in the least is the Zermatt cemetery where several mountaineers lie buried. Hotel Alpenhof is located in the center of Zermatt, in a sunny, quiet location near the train station. The opposite cable car Sunnegga and the Gornergratbahn, which is only a five-minute walk away, lead you directly to Zermatt’s ski and hiking paradise – within easy reach of the Matterhorn. Hotel Albana Real in Zermatt welcomes you to a refined yet familiar atmosphere. The luxurious cozy rooms, expressing a touch of Art-Deco, invite you to enjoy tranquility and relaxation. Hotel Butterfly is ideal for modern globetrotters and active snow sports enthusiasts. You feel comfortable in the cozy rooms and you feel at home. The center of Zermatt is around the corner. The train station, the famous Gornergratbahn and the mountain sports facilities can be reached in 3 minutes on foot. If you’re planning on climbing the Breithorn, you can easily take the cable car to Klein Matterhorn in the morning and climb the peak up and down in a few hours before returning to Zermatt for a delicious raclette. However, for those who wish to have a bit of a mountaineering feel, other options are available. The Gandegghütte is a cosy little mountain hut accommodating climbers and hikers. It is located about 30 minutes from the Trockener Steg cable car station. Not only is it a great base for climbing Breithorn, but it provides a comfortable night of sleep for those who wish to hike the Tour de Monte Rosa or hike to Theodulpass. From the hut, you get splendid views of Breithorn and the Matterhorn. Spending a night in the Monte Rosa Hut is a great experience. This innovative structure has a very recognizable silver-colored surface that looks like mountain crystal. But not only the structure is modern. The several integrated solar panels and thermal solar collectors provide 90 percent of the energy consumed by the mountain hut. Melting water is collected in a rock cavity while a filter system cleans the wastewater. The hut is mostly used by mountaineers looking to climb the Dufourspitze via the normal route. While the Breithorn is often overlooked due to the neighbouring Matterhorn, the massif is one of the Alps classics. Despite the fact that this 145-kilometer trek circumnavigates the Matterhorn, it provides great views of the Breithorn on the sections near Zermatt. It is best done during the summer in July or August when the weather is good and the mountain huts where you’ll be staying are open. Some experience with glacier hiking may be necessary as you will be crossing the Theodul glacier. An alternative is to hire a guide for this portion of the trail. The Tour de Monte Rosa is another multi-day trek in the same area. It provides great views of the Monte Rosa massif, the Matterhorn and the Breithorn as well. It crosses the Theodulpass, the second highest mountain pass in the Alps and explores the Valais region and the Valle D’Aoste. Along the way, spending your nights in cabins such as Europahutte and Gandegghutte makes the experience of hiking in the Alps even better. Both Gandegghutte and Theodulhutte are recommended stayovers offering splendid views. The Abenteuerweg or Adventure trail is a steep trail (900 meters in little over 4 kilometers) leading from the Rothorn to Tufteren. You will be descending all the way and still be rewarded with magnificent views of the surrounding 4,000-meter peaks, including the Breithorn. The trail takes about 1h40 min to complete, without the many stops for taking pictures, that is. This short hike is suitable for a levels. Along the way, you will be enchanted by panoramic views of 29 mountains above 4,000 meters. So, you could say that the trail lives up to its reputation. Few trails this short provide such scenic panoramas of the Alps–a real must if you are short on time. The Gornergrat is situated at the end of a mountain train line, so it’s easy to take a train back to Zermatt afterwards (CHF 40 one-way). From this point, you are offered great views of the Monte Rosa, Lyskamm, Castor, Pollux and Breithorn. You can reach Gornergrat by hiking to Riffelalp through the forest and then take the furthest trail to the south above the Gorner valley. This leads to the Riffelsee, where you will see the trail going towards the Gornergrat. It takes about five hours oneway, so if you intend to hike back down as well, be sure to make an early start. At Rifferalp, you will pass by a 5-star hotel that features some of the most delicious Rösti with bratwurst. This hike brings you under the north face of the Matterhorn, meaning you will catch great views of the Monte Rosa massif and the Breithorn. It is one of the classic hikes that takes you through the beautiful hamlet of Zmutt. The ideal walk would be to make a loop by starting via Eldelweiss and take the high contour via Hubel. A detour via Zumsee is recommended if you are getting hungry after the walk. Max und Greti’s offers the best cinnamon ice cream you will eat during your visit to Switzerland. They also have full menus available. A popular option for a hike is towards Trockener Steg and Gandagg Hutte. The route passes Schwarzsee, which offers great views of the Matterhorn and surrounding 4,000-meter peaks. The ascent to Trockener Steg from Zermatt ratchets up the altitude meters. If you’re not sure about your physical capabilities, there is the option of using the cable car before descending back to the village. Gandagg hutte, located about 30 minutes from the Trockener Steg cable car station, offers great accommodations for an overnight stay. In the area are great walks towards the Theodulglacier or even Klein Matterhorn. For those with mountaineering ambitions, the Breithorn is a peak within access of most abilities. If you have no prior experience in mountaineering, be sure to hire a guide in Zermatt. Hikers, on the other hand, are tempted by the Theodulpass close to the Breithorn massif, since this is not only one of the highest passes in the Alps, but it marks the border between Italy and Switzerland. There is no doubt that hiking is one of the best things to do while spending your time in the Mattertal. This will provide you the best views of some iconic 4,000-meter peaks. The cable car up to Klein Matterhorn makes it easier for those with less time. Also, with over 100 kilometers of biking trails reaching 1,400 to 3,100 meters of altitude, the region around Zermat offers a unique mountainbiking experience suitable for all levels. Day tourists will have no problem filling their day in Zermatt by visiting the Matterhorn Museum, wandering the streets and enjoying some delicious Valais specialties in one of the many restaurants. Chances are high that you will need to take the train to leave the Mattertal (or at least Zermatt). However, the Glacier Express from Zermatt to Brig is known for its scenic mountain views and is considered as one of the best train journeys in the world. Here you can check for things to do in Zermatt. Spending your holiday in Zermatt with small children? Even if your children can’t yet walk, there are some great options for hiking. The Rundwanderung Täsh is a great round-trip hike suitable for those who wish to get some great views. The little altitude difference makes it ideal for families with children, even if you decide to bring a baby carriage. You can swim in the Schalisee Lake, rest at one of the many playgrounds along the route or enjoy the views on the Breithorn. The best travel times to the Breithorn are the months of May through September. The average day temperature fluctuates between 20 and 25 degrees, although it can still get very cold up the mountain. The greatest chance of sun is in July and August. In general, Switzerland can be visited all year round, but for wintersport the period from January to March is the best travel time. For hiking in the mountains the best time is from July to September. The high season in Zerrmatt is from the end of June to the end of August and from the end of December to the end of March. Switzerland is a popular destination for both winter sports enthusiasts and fanatical hikers because of the Alps. Wallis, also known as Valais, is a popular region. It is the region around Breithorn and the more famous mountain Matterhorn, including the tourist town Zermatt at the foot of the Breithorn. In spring, the tender flowers of the Soldanella are the first to penetrate the alpine meadows through the last layer of snow. It is the beginning of a beautiful flower season, which is considered by many tourists as the main attraction of Valais. In the months of May and June the deep blue gentians still bloom on the slopes between 1200 and 1600m; after that, the flowers in the higher areas are fully in bloom. The climate in Valais ensures exceptional vegetation. Due to the influence of the sun, the tree line can rise above 2000m. Anywhere else in Europe trees usually won’t grow above 1750 m. As people get higher up in the mountains, however, the vegetation decreases. Logical, when one considers that the average temperature ins July at 4000 m altitude is -9 ° C.
The Swiss Institute for Nature Conservation has ensured that a large number of flowers and plants are protected in Valais. This means that it is forbidden to pick or dig out such flowers or plants. 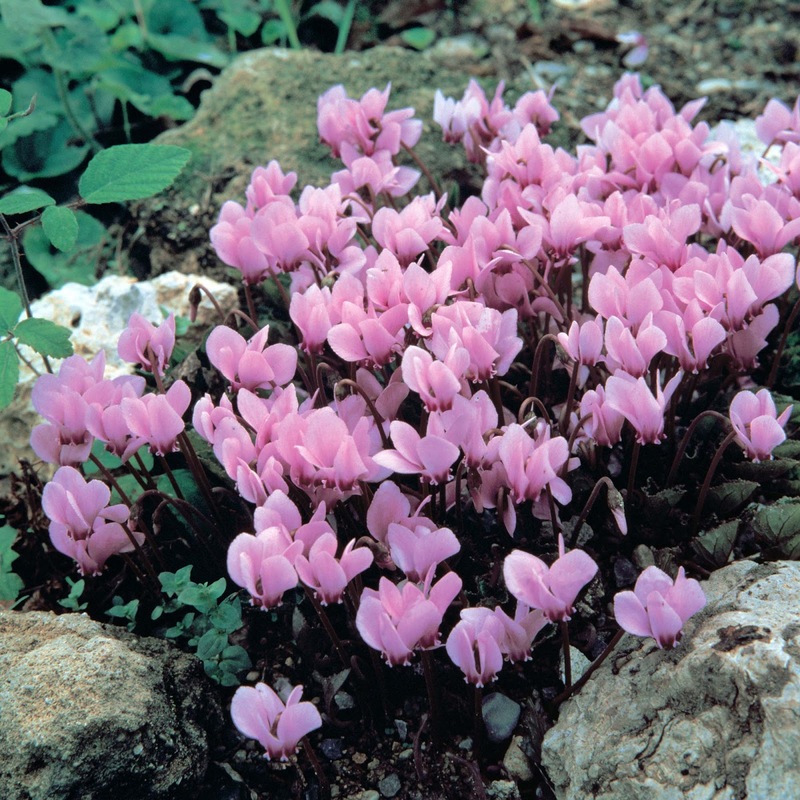 The pink mountain Cyclamen and the blue Alpine Columbine are protected. Various lilies may also not be picked, and the same applies to various orchids that can bloom on the alpine pastures. Of course there is Edelweiss, but that plant has become so rare that it is hard to discover it in the wild. Also the alpine roses (family of the azalea) are protected, just like the Männertreu, a deep red to vanilla scented flower, which is named so because it almost immediately falls out when it is unexpectedly plucked. Which casts a light on the one who made up the name. Thousands of succulents and mosses thrive on rocky ground. In the endless alpine meadows, herbs grow like thyme, cumin and fennel. These plants are often decisive for the strongly scented alpine air that guides walkers almost always on their journey. Not protected but also worth mentioning is the yellow Arnica Montana, a plant of about 50 cm height, which is often used to relieve pain during sprains or contusions. The rubbing with a single flower on a bruise can provide relief after a short time, but more solace offers a brew of boiling water with some crushed flowers that has been able to attract at least a quarter of an hour. Here compresses can be soaked. The Institute has had since 1976 a unique visitor center on the Riederalp (Villa Cassel), where thousands of visitors come every year. This villa was built in the beginning of the 20th century, and Churchill spent his holidays there. He said he slept like a Murmeltier, and he felt as healthy as never before. The Murmeltiere Churchill speaks of are the specific alpine marmots, which occur everywhere in Wallis, but especially in Aletschwald. They live in colonies in very extensive cave systems. Their hibernation lasts from October to April. Other animals are of course the chamois and ibex, which generally live above the tree line and are excellent climbers and jumpers. Their food consists of grasses, mosses, pine needles, twigs and tree bark. During the winter months they often come a little lower, in search of food. It is interesting to be able to observe the animal spores in the snow. In the typical Valaisian fauna, you should of course also mention the Saint Bernhard dogs, which can be visited on the eponymous pass, and the black Ehringer cows, which mainly occur in the Val d’Anniviers. Valais also has a number of birds of prey, including the golden eagle, the griffon vulture and the eagle owl. The large swarms of alpine crows (Dohlen), which live at high altitudes in the summer, and find plenty of crowing around hotels and holiday homes in the winter, hoping to find something to their liking. I am probably out taking pictures right now. But you can send an email and I'll get back to you, asap. I consent to Marvel Mountain collecting my details through this form.